We can ship any of the above formations. 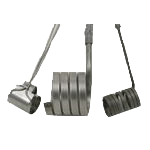 We have pre-coiled Cable Nozzle Heaters ready to ship and plenty of straight cable heaters for custom forms and applications. 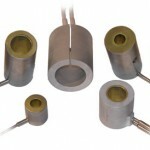 If we do not have the right cable heater in stock, we can have one made to your specifications. Ideal for applications where space is limited such as hot runner molds with multiple cavities. The heating element fits easily into the small area and heats with precision and efficiency. 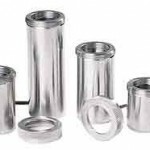 With a precision machined inside diameter it does not require clamping bands. Along with the excellent thermal conductivity of Brass, the K-ring Pressed in Brass construction gives extremely even temperature profile across the heater. Features a 5 in (127mm) long no-heat tail section. This design advantage eliminates failures in the adapter area due to overheating. Provides easy installation in the tight environment of multiple-gate mold. Also available with Axial Clamping with Mini Cable – options on the mini coil heaters for OEM hot runner systems (popular OEM designs: 534234, 520156, 534233, & 521334). Flat Coil Heater – flat coil heater set the standard with respect to precise fit and profiling to optimize the performance of nozzles and other mating components. Available with or without internal thermocouples -Type J or Type K. At 2.5mm x 3.4mm contact is maximized resulting in less required heated length and more watts per linear inch. 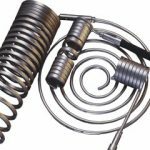 HotLock Coil Heater & Gamma Series Dual Sleeve Mini Coil Heater– The new design utilizes a positive locking positioning ring and machined components to reduce manufacturing complexity. Installation is easy with a twist of the end cap ring the heater is secured into position on the nozzle, and with the integrated thermocouple slot located under the cap the thermocouple is precisely located. No tools are required for installation or removal We stock and supply various sizes of round, square, and flat coil cable heaters. Available with and without internal thermocouples. Possible operating temperatures to 1200’F to cover the majority of application needs. Dimensions from 0.040″ (1mm) to 0.188: (4.8mm) diameter. The cable heater packs a lot of heat into a tiny space!